1. How to get incoming call number in android (Broadcast receiver for incoming number)? 2. How to get outgoing call number in android (Broadcast receiver for outgoing number)? 3. How to know call is ended or not in android? 4. 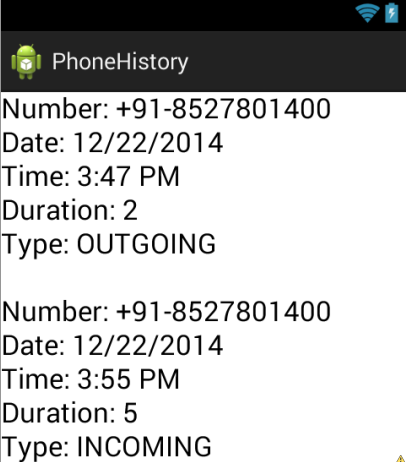 How to get call log details after ending call in android? 5. How to create and use SQLite Data Base in android? 6. How to fire Content Observer after ending call? I had worked a lot with phone state and spend time and money to know what exactly android doing. Now I am here with working code and going to share with all coders. 1. Ringing: call is coming. 2. Idle: inactive or call disconnected. 1. Idle state call once again after idle state sometime (or in some device). 2. Idle state call in between Offhook state sometime (or in some device). 3. Call ended but call log not created yet and we queried to fetch new call log information and get wrong result sometime. Hmm… Problems can create new problem(s). But After lot of research, finally I solved all the problems and used Content Observer to keep track on changes in call logs and use if condition to solve call end problem. Now Content Observer is creating a new problem and calling many times and giving single and exact call details multiple times. Using if condition this problem is also solved. 1. MainActivity.java : To display result. 2. PhListener.java : To listen phone state. 3. DBHelper.java : To store call log details in database. 4. History.java : To fire content observer to keep track on changes in call log. Now change AndroidManifast.xml file and define all necessary permissions. "Cursor managedCursor=c.getContentResolver().query(CallLog.Calls.CONTENT_URI, null, null, null, android.provider.CallLog.Calls.DATE + " DESC");"
requires android.permission.READ_CONTACTS or android.permission.WRITE_CONTACTS, add those permissions in your manifest file. Not Showing any history Worst ! Hi, I have a questios about broadcast receiver. How can ı dedect call when it is anwered. when i look examples ı found that listener "CALL_STATE_IDLE,CALL_STATE_OFFHOOK". All details are given above and Call state offhook is called when user is on call. bagaimana cara mengetahui bahwa telepon sudah terhubung pada saat pengguna menggunakan pemanggilan telepon keluar ? Hi, how could I do to read call log only for one contact (for this contact, I know id, name and phone numbers) ? for me also when i run the code it shows that "NO INCOMING AND OUTGOING CALL HISTORY EXISTS"
Had you resolved the issue ? pada pemanggilan telepon keluar berlangsung dan klik untuk menyelesaikan panggilan. maka bagaimana caranya untuk mengetahui durasi panggilan tersebut ? sir i have error no incoming and outgoing call exists!! !